F This Movie! : What is Your Halloween Tradition? What is Your Halloween Tradition? Six more days till Halloween, Halloween, Halloween. We're in the last week of #ScaryMovieMonth (RIP #ScaryMovieMonth), which ends this Friday on Halloween! Do you have any special movie you watch every year on October 31st? Any weird rituals you care to share with the group? Is this the year you're going to start a new tradition? By the next Weekend Weigh-in, Halloween will be over. Let's talk about it now. My Halloween night tradition over the years has been to watch "Sleepy Hollow" (1999) followed by "It's the Great Pumpkin, Charlie Brown". My streak of watching Sleep Hollow started in 2000 and I don't think I have missed a year yet. We used to watch The Great Pumpkin, but not as much these days. I watched it last week, or the week before though. It's The Haunting, for me. Whatever walks there, walks alone. It's Trick 'r Treat and the original Halloween for me. I tend to have a bit of a marathon on the day/evening of Halloween, and the line up changes, but those two are mainstays. Used to watch Bravo's 100 Scariest Movie Moments every year, but I got sick of it. Boring answer but I do watch a Halloween movie. Season of the Witch is one I know is not great but I do love it.
" Three more days to Halloween. 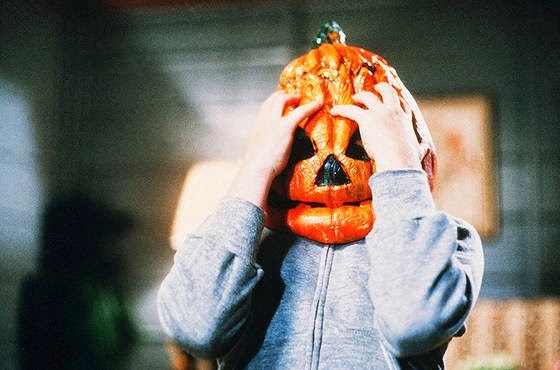 Halloween III is where it's at for me too. That, and I listen to scary movie music all day, briefly punctuated by at least part of Oingo Boingo's farewell concert (recorded on Halloween '95). If I haven't heard "No One Lives Forever" it just ain't Halloween. The other thing I do is lament living in Florida, where it never actually feels like Halloween. May I suggest you try it with the Movie Crypt commentary this year - I haven't listened to it yet myself but can only imagine it's pretty great! I've been doing a Simpsons Treehouse of Horror marathon the last few years. Up to 25 episodes now, which is a good 8-10 hours of entertainment. We also do a Christmas one, and usually a third one during the year. As a side note any chance you'll be doing a podcast on the non-horror releases during scary movie month? John Wick and/or Gone Girl specifically? I usually will watch The Exorcist on Halloween. And typically, following that is the original Halloween. If it lands on a weekend I like to have an all day horror marathon, which is ALWAYS accompanied by a crock pot full of vegetable soup. Mmmmmmm. I love Halloween. I pretty much just wing it - sometimes I go out (but not as much as of late) - usually I watch some scary movies but not necessarily anything in particular - looking forward to having a kid so I can hit the streets trick 'r treating again! Exactly :) I'm thinking having a kid is going to allow me to do a whole bunch of things a "mature" "man" "shouldn't" do. My tradition is sometime in the month of October, watch the 1950's Invasion of the Body Snatchers and the 1970's version, because it's my favorite "horror" movie. I always try to watch a classic that I haven't seen yet. Last year was Suspiria, this year it's the original Texas Chainsaw Massacre, which I'm very ashamed to admit I've never seen all the way through. Nothing to be ashamed of! No one can see ALL the movies (though I would like to try). Shameful would be "I refuse to see this movie that's considered a classic because I am stubborn or ignorant." And that's not you! I suppose the real concern comes not from how many times I HAVEN'T seen The Texas Chainsaw Massacre, but from how many times I HAVE seen Texas Chainsaw 3D..............the answer is 3. I have seen Texas Chainsaw 3D 3 times. Which you could argue is 4 times too many. Every year, I watch John Carpenter's The Thing. It's my favorite horror flick. I sit down with the Blu Ray, a snack (usually Doritos, because I lack self-control), and a pumpkin beer...or three. I turn off the lights, turn off the phone, shush the girlfriend, and just enjoy the film. What a great portrayal of paranoia and isolation. I just love this movie. Usually try to watch Young Frankenstein in honor of my mom, though it doesn't always happen. What does always happen is putting on the Night on Bald Mountain segment from Fantasia. My Halloween tradition celebrates it's tenth anniversary this year. It's watching Zack Snyder's Dawn of the Dead with a Lou Malnati's deep dish sausage pizza. I guess technically the pizza part of it is only nine years old, seeing as I couldn't get the pizza to the movie premiere. My tradition for the past 9 or 10 years goes something like this. Promise myself, starting around mid-September, that this year This Year I will actually come up with a cool costume idea and execute it and go to a cool Halloween party or do something festive. Then the actual day comes around and I have once again failed to think of a costume I like well enough to actually go through the effort of making it. Then I end up working late or some other thing and come home and go to sleep. This year I am right on track to continue this tradition.